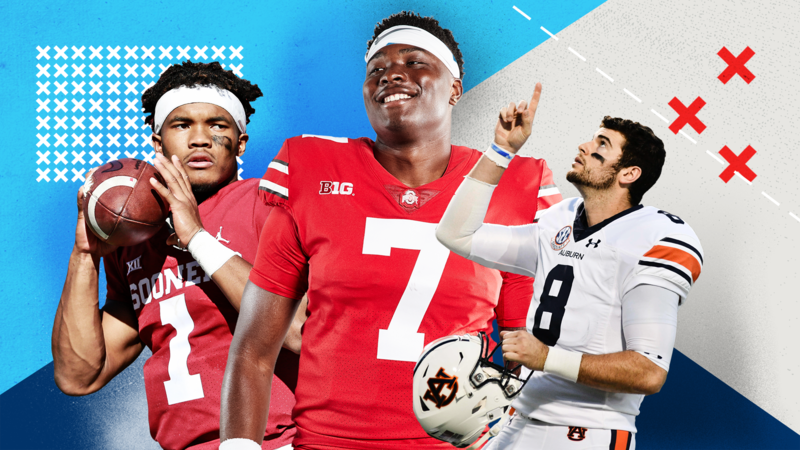 Todd McShay provides his final ranking for the best 300 players in this year's draft class, plus nearly 800 prospects featured in his position rankings. NFL Nation reporters played general manager for the teams they cover and made picks in a first-round mock draft, featuring the Giants snagging two potential franchise-changing players. Iowa defensive end Anthony Nelson is a tall, well-built left defensive end with excellent length and average top-end speed for his size. Ohio State cornerback Kendall Sheffield is an explosive athlete with good strength and excellent straight-line speed. Utah outside linebacker Cody Barton is an average-sized linebacker with below-average length and very good top-end speed. San Diego State tight end Kahale Warring is a developmental tight end with average size, slightly below-average length and excellent top-end speed. Old Dominion wide receiver Travis Fulgham is a big receiver with excellent length and average top-end speed. UCF defensive tackle Trysten Hill is a highly gifted defensive tackle with a good combination of height, length, weight and speed. Georgia outside linebacker D'Andre Walker has a quick first step and excels at anticipating the snap. Charlotte offensive guard Nate Davis has got the first-step quickness and power base to move defenders off the ball when his technique is sound. Washington tight end Drew Sample is a reliable receiver with outstanding ball skills. What Roethlisberger does with his last contract can redirect momentum after the Steelers' disappointing 2018 and finish his career in a positive place.